8x10 Giclee Illustrated Print of Girl with Whales, "February"
Amazing artist. Beautiful quality prints. Great communication. You will not be disappointed. Great Etsy seller. Beautiful Print- lots of detail and colors are fantastic! 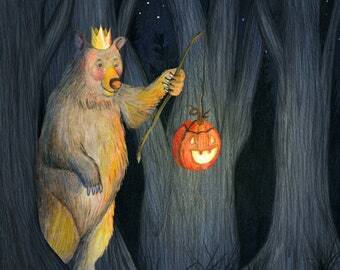 Here I am in my fairy tale world. It's a pretty wonderful place to be. 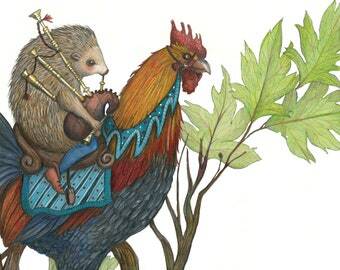 Magical, musical animals, like Hans-My-Hedgehog, a Grimm's fairytale, became the basis for the theme of my shop. Most of the time animals steal the show, but one in a while people take center stage, like the Goose Girl. A high level of detail can be found in all of my works. Black and white is timeless. Here I am at work in my studio. Draw, Jessica, draw, and don't waste time! Michelangelo once said, "Draw, Antonio, draw, and don't waste time!" What good advice that is. I came to art as a very young child. I remember asking for a sketch book for a birthday or Christmas present when I was maybe six or seven. My mom bought me a small, grey-covered ringed sketchbook. In fact, I still have it; it's filled with marker drawings of superheroes of my own design and pencil sketches of my dog. Though it was the first of many, I will always keep the first evidence of my love of art close to my heart. I eventually graduated college with a degree in Studio Art and Art History, with a concentration in Illustration. In contrast to my early discovery of art-making, I came to be an art historian much later, but it really started with a love affair with Bernini and Michelangelo in the ninth and tenth grades. I didn't know it then, but flipping through some art history books was going to change my life. After many years of toil and a year abroad in Rome, I eventually earned my master's degree and my Ph.D. in Art History. I now teach college-level students in New York City to find the beauty and humor of art. Though I work by day as a professor of Art History, my first love will always be creating art. When I'm drawing, I feel like that child again. 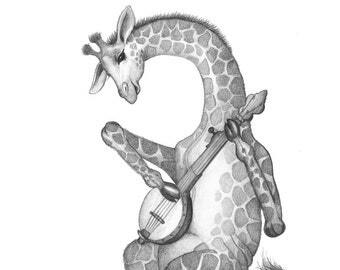 In my shop, I draw mostly animals: magical, often musical animals. The way I'd like to think that they are when we go to sleep at night. 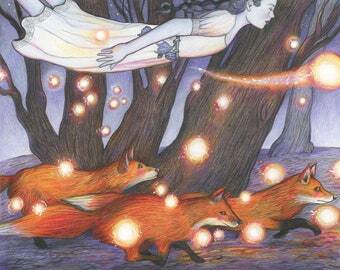 They remind you of a world of fairytales and myths, where things are not what they seem. 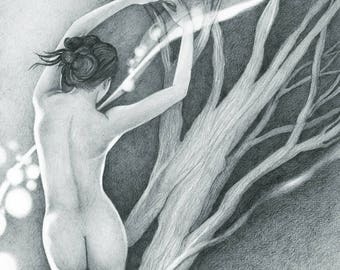 I work mainly in pencil for the level of control it offers. I offer cards, high quality prints, and pillows with my magical animals on them. Please enjoy! I am an art historian and an illustrator living in NYC with my husband Mike and my dog Ludo. I'm inspired by that magical world that we can't see, or that we choose not to see. I go crazy with pencils. See for yourself. www.americanarteditions.com This American-run small business is the printer of my museum-quality giclée prints that I sell in my shop. Located in Apex, North Carolina. Welcome to my little shop. I hope it will make you smile! I take the utmost care in packaging my products to ensure a safe delivery. All cards are packed in a clear envelope. I tie each package with a satin ribbon. I mail in rigid mailers. Giclée prints are backed with archival backing boards and protected in acid-free sleeves. They are tied with a ribbon and packed in a rigid mailer so your little beauties will arrive in perfect condition. Shop with confidence! If your item is damaged in transit, I will make it right. Simply send me a photo of the damage that has been incurred within 14 days of receipt and I will replace your order promptly. If you wish to return an item, I will accept it back within 14 days of receipt and refund your money via paypal after the item has been returned unharmed. Buyer will pay return shipping. If an order is returned to me from US or abroad from the UPS or other shipping service with custom fees unpaid, I will refund an order minus a 25% restocking fee. Currently we accept PayPal and credit or debit card through direct checkout. I ship first class only. Within the US it usually takes 2-4 days depending on location to receive your item. If you need faster shipping, please send me a message and I will create a separate listing for you. International patrons: tracked shipping is significantly more expensive. If this is what you prefer, please send me a note and I will create a separate listing for you. Please note that buyers are responsible for any and all duties and customs charges that may be incurred. of delivery would be at the discretion of your country's tax regulations. information please refer to your local customs agency. If an order is returned to me from US or abroad from the UPS or other shipping service with custom fees unpaid, I will refund an order minus a 25% restocking fee. Unless otherwise noted in my shop announcement, I always ship within twenty-four hours and sometimes on the same day. For international packages, I will give you a time frame in which to expect your purchase. Custom orders or orders that have been ordered from the printer generally ship within a wee. Custom orders may incur an extra shipping fee. If you wish to have a gift note added to your purchase or to have your purchase shipped to a gift recipient, please simply let me know. I accept custom orders! Please send me a message.